A continuing series on weekly meals that use sustainable, organic, local and ethical food during the challenging winter months. For more information, go here to the DDC section of Not Dabbling in Normal’s website: Dark Days Challenge. 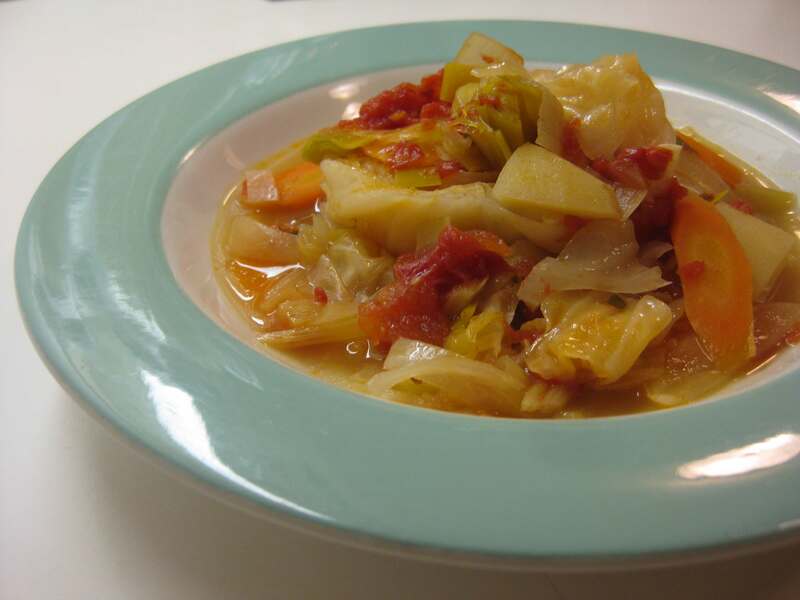 This light and healthful cabbage stew offers an appetizing antidote to holiday indulgences. 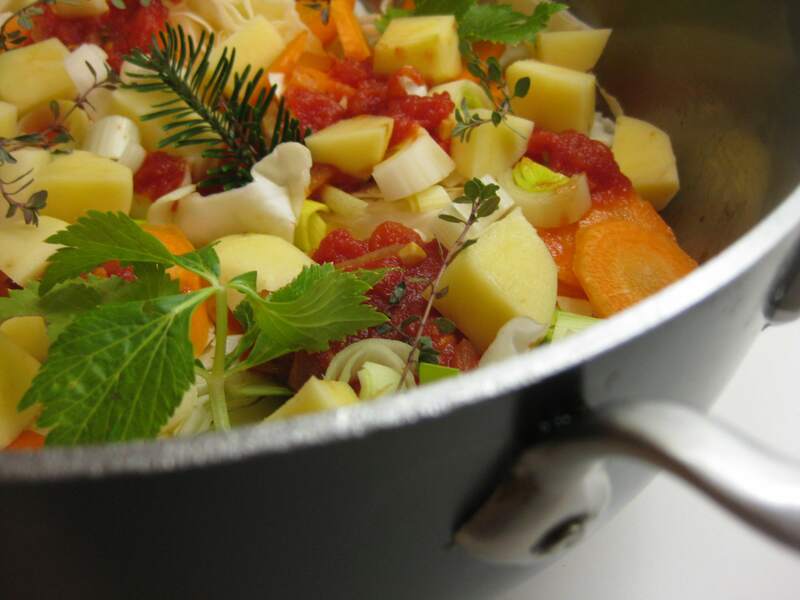 Redolent of spruce needles from our Christmas tree (substituted for the more traditional juniper berries), this stew feels restorative during the dark days. A simple layering of local vegetables gently stewed in homemade poultry stock and white wine and favored with local honey, herbs like Asian celery and thyme from my garden, a couple of spices (in-bounds for my dark days challenge) and a sprig of spruce. I used a light homemade duck stock but a light chicken or turkey stock would be fine, as would vegetable broth. I canned the tomatoes from CSA produce last summer. The cabbage and carrots also came from our CSA, and the organic potatoes and wine (“Vidal White”) from nearby Terhune Orchards. I luckily stashed lots of onions, leeks and garlic from the farmers’ market in late fall. All set for all local. Though I love this stew meatless, you can add a cooked savory sausage to it. If I’m using sausage, I add it when serving since the subtle flavors of this stew are part of its appeal. I’m sure some will think I’ve gone over the edge to cook with pine needles but they’re not so different from rosemary. Really. Illustrious chefs like Rene Redzepi from Copenhagen (2011 international chef of the year) use them all the time, making spruce butter, oil, and vinegar, and drying them to a powder. I’ll have to give those ideas a try as we dismantle our locally sourced Christmas tree. Of course, you have to know where your tree comes from so that you can be assured that it wasn’t sprayed. We have a fun family tradition when it comes to our Christmas tree. Instead of plunking it down at the curb, we remove the needles and cut up the rest for kindling. We sew the needles into little pouches (4-5 inches square) that become sachets to keep our beds refreshed. This is an Adirondacks tradition. 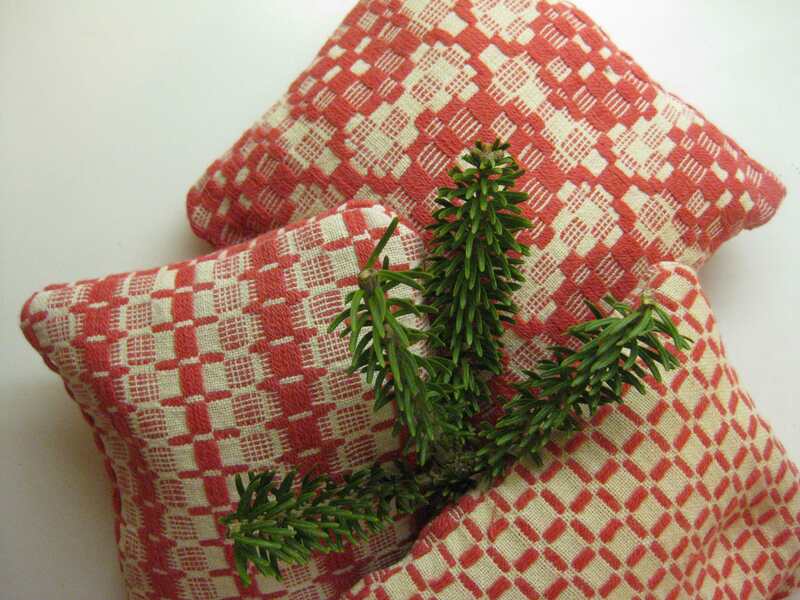 Last year, I cut up a ragged old red and white woven blanket and mixed and matched the various patterns. Other years, I have used vintage cotton patchwork squares or wool in tartan plaids. It’s a nice way of remembering – all year long — the family gatherings at the winter holidays. And then we start all over again. Preheat the oven to 325 degrees. Trim the cabbage. If there are outer “wrapper leaves”, blanch them in boiling water and cut them into 2-inch squares. Slice the rest of the head into thick wedges (1½ – 2 inches at thickest part). In a large ovenproof pot, saute the onion in a little oil or ghee and add the garlic, cooking briefly. Remove from the heat. Place the cabbage squares (if any) on the bottom, layer the cabbage wedges on top, spoon on the tomato puree (or add halved peeled tomatoes), and strew the other vegetables over the top. Bury the spices in the pot, including the sprig of spruce (handle the spruce carefully since you will want to remove it before serving). Combine the stock, wine and honey and pour over the vegetables in the pot. Bring to a light boil on top of the stove, cover the pot tightly with foil and place the lid on top. Transfer to the oven and cook for 25-30 minutes until the vegetables are tender. Remove the sprig of spruce and serve in shallow bowls. I love both of your ideas for re-purposing your Christmas tree! The soup sounds fantastic and the pouches are such a great idea and so pretty!